This was my first ever visit to Oulton Park. The timetable for the weekend was not the usual Saturday and Sunday affair but instead a Friday and Saturday schedule. We had testing Friday morning, which was a god send as this track is complex, and qualifying in the afternoon. 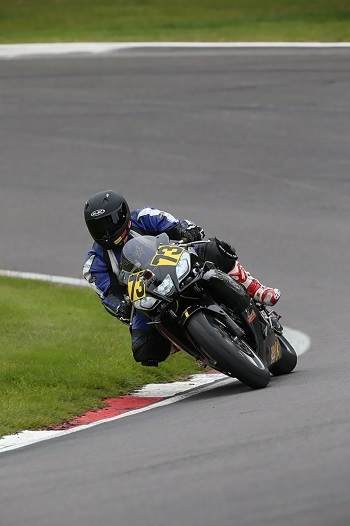 Again I entered two classes so had two qualifying sessions and four races on the Saturday. The Thunderbike sport (TB) qualifying was in the wet so not much fun and then the sun came out and the track dried for the Minitwin (MT) qualifying but the session was red flagged and moved to the morning. It rained heavily overnight and first thing was wet so again the MT qualifying was on wet tyres. My start positions for the first races were 26th and 27th in the TB and MT. Saturday started wet but quickly dried up. All our races were in the dry starting with the TB race. I started 26th and finished in 21st. The bike felt good but my lack of knowledge of the track and commitment to some fast corners left me trailing. I started my MT race in 27th. I started to get more comfortable with the track and got faster, again finishing in 21st. I started my second TB race in 21st and the bike felt great and I felt like I was really finding my way around the track and the times were improving lap on lap unfortunately I forgot to refuel the bike and only managed two laps before the bike died as I crossed the start/finish line. A short walk back to the pits and I watched the remainder of the race from the pit wall. The final race came after a side car dropped oil through island bend and into shell oils hairpin. It had been treated with plenty of concrete dust but I decided that enough was enough and retired on the third lap. I enjoyed Oulton but would have liked more time, I reduced my times from 2:20 down to 2:04 just on Saturday. TB Race 1. I qualified 26th with a time of 2:09.376 and finished in 21st with a fastest time of 2:06.294. MT Race 1. I qualified 27th with a time of 2:26.763 and finished in 21st with a fastest time of 2:04.106. MT Race 2. I started 21st and retired from the race. My fastest time was 2:10.495.